The American College of Sports Medicine (ACSM) and ecoAmerica have joined forces on a new active transportation program to help support the health of Americans and the climate. The partnership will combine ACSM's vision to promote active transportation and related health co-benefits with ecoAmerica's Climate for Health program. Having served as the CEO of the National Swimming Pool Foundation since 2003, Thomas Lachocki, Ph.D., has announced his plan to retire in 2019. According to a recent report published by the National Recreation and Park Association, the majority (84 percent) of local park and recreation agencies offer summer camps, more than half (55 percent) offer after-school programming, and more than a fifth (21 percent) offer before-school care. Nationwide, 15.8 percent of young people ages 10 to 17 have obesity, according to the newest national data. Mississippi has the highest youth obesity rate, at 26.1 percent, while Utah has the lowest, at 8.7 percent. Sports Turf Managers Association kicked off its sixth annual Mowing Patterns Contest. Registration is open for the 2019 CPRS Conference & Expo being held in Sacramento, March 19 to 22. 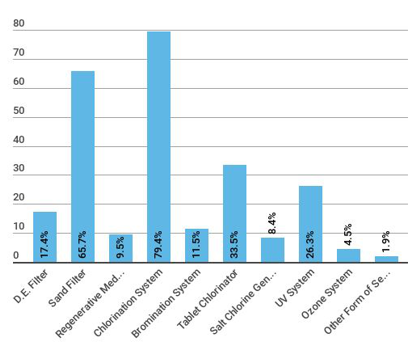 According to our Industry Report survey of aquatics respondents, chlorination systems are used by nearly eight in 10 (79.4 percent) respondents. Tablet chlorination was used by 33.5 percent, and 8.4 percent said they use salt chlorine generators. Another 11.5 percent of respondents said they are currently using a bromination system. Regarding filtration, the most commonly used form of filtration was a sand filter, used by nearly two-thirds (65.7 percent) of respondents. Another 17.4 percent said they use D.E. (diatomaceous earth) filters, and 9.5 percent said they use a regenerative media filter. When asked whether they employ secondary forms of disinfection on their pools, 32.7 percent of aquatics respondents said yes. Some 26.3 percent of respondents said they currently use UV systems, and 4.5 percent use ozone systems. Another 1.9 percent said they use another form of secondary disinfection. For more information, read Greener Than Ever: The Latest Trends in Grounds & Turf Management. After the city of Blue Springs, Mo., purchased a building to renovate and transform into a state-of-the-art recreational fieldhouse, one of the top goals was to install new flooring. For more information, read What's Under Foot?. In recent years, unstructured play has often lost out to more structured educational time. But parents and leaders are pushing back, recognizing the myriad benefits that play can deliver. For more information, read The Multi-Faceted Value of Play. With a popular program providing sports clubs, competition and just plain fun to a diverse audience of students, UT Austin updated its facilities to accommodate even more opportunity. For more information, read Taking the Field. Shane's Inspiration has built accessible playgrounds throughout the Los Angeles area, but it also goes one step further, by introducing programs that get kids of all abilities to play together. For more information, read Building Bodies, Building Awareness.